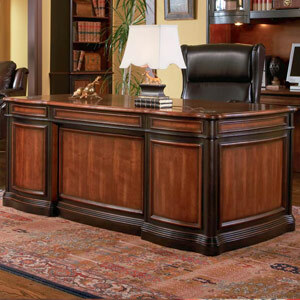 Traditional style desk that is sure to make a bold statement in any office. Crafted from selected veneers and hardwood solids, this durable piece will offer sturdy and long lasting function in your office. Spacious storage drawers are dovetailed and corner blocked for added durability, with the addition of great features such as felt lining in top drawers, and locking file drawers for your peace of mind. Ball bearing glides make for easy drawer use, while power strip and drop front keyboard drawer offer simple computer use. Clean lines, classic molding, and a warm two tone wood finish give this piece a timeless look that will complement any decor.